Kaia Gerber loved working with her fashion ''hero'' Karl Lagerfeld on their joint capsule collection. 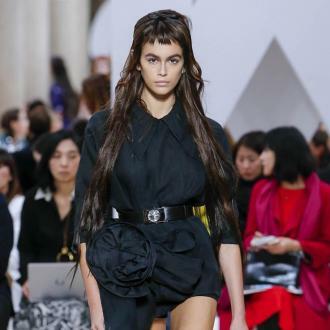 Kaia Gerber admits it was an honour to work with her fashion ''hero'' Karl Lagerfeld. 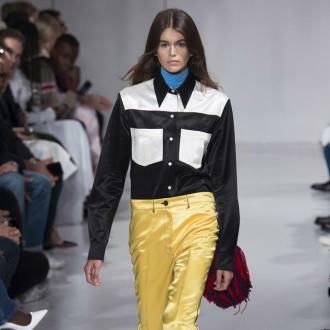 The 16-year-old model - who is the daughter of 90s catwalk icon Cindy Crawford and her husband Rande Gerber - has created a new capsule collection for his eponymous brand and she was inspired by how passionate Karl, 84, still is about clothes. The Karl Lagerfeld x Kaia Capsule Collection was unveiled in past week, with a star-studded party hosted in Los Angeles attended by Kaia, Corinne Olympios, Sabina Gadecki and Larsen Thompson. Among the products for sale are a leather biker jacket - which is inspired by her Harley Davidson riding dad Rande - a tux jacket with striking stripes down the arms, skate shoes and a studded handbag, and Kaia is particularly pleased at how the range marries Californian cool style with Parisian chic. Kaia - who first met Karl in September 2017 at a fitting for Fendi - said: ''I'm from Malibu, and there's a Californian casual way that people dress here. Then there's the Parisian look, which is very chic and very pulled-together, but in also a cool and casual way. I think Karl and I really wanted to just bring the two worlds together. Kaia has admitted that when the opportunity arose to design the line, she was already prepared as she often spends her free time creating ideas for garments. She explained: ''I always have mood boards going, no matter if I'm working on something or not - I just like having inspiration. I basically already had all my ideas [when they called].